Orange-fleshed sweetpotato (OFSP) is an impressive crop, able to grow on marginal lands and produce nutritious roots within three months from planting. 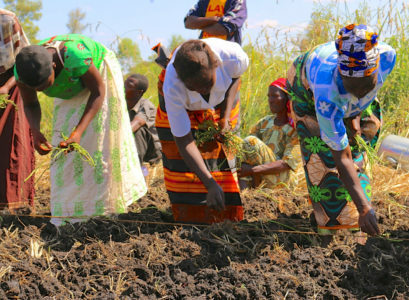 However, farmers plant vine cuttings rather than seeds, and getting enough vines to plant at the beginning of the rainy season can be a challenge for smallholders in sub-Saharan Africa (SSA). 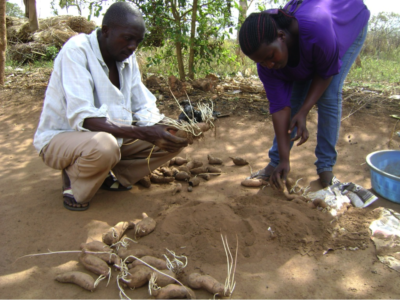 This is especially true in areas with long dry seasons, and it is one of the challenges of sweetpotato farming that will likely grow more difficult as climate change advances. Triple S was largely developed by CIP researcher Sam Namanda, who improved upon farmer practices in Tanzania and Uganda, where he did his PhD dissertation research. He now promotes Triple S in Uganda, where it is being adopted by everyone from subsistence farmers to vine multipliers. “With Triple S, farmers are able to plant earlier, harvest earlier, and get better yields,” Namanda said. He explained that while Triple S is enabling farmers in Uganda’s dry northern regions to grow sweetpotato, in the country’s more humid central and southern regions, the ability to plant with the first rains allows farmers to produce two, and in some cases three harvests of OFSP roots per year. Mihiretu Cherinet, who works for CIP in Ethiopia, explained that Triple S is facilitating OFSP production in extremely dry areas of his country, such as the Tigray Region, in northern Ethiopia, where the dry season can last as long as nine months. 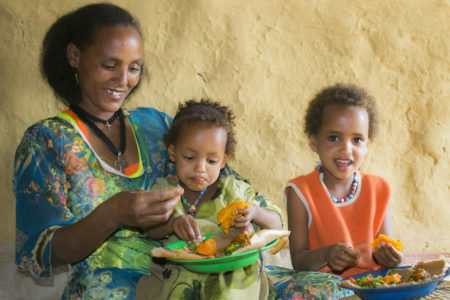 Sweetpotato wasn’t grown in in Tigray before CIP began promoting the crop there, and more than 60 percent of children under five in that region suffer vitamin A deficiency. The Regional Bureau of Agriculture and Natural Resource Management and CIP are consequently getting the region’s farmers to grow vitamin A-rich OFSP varieties. “Farmers in very dry areas are thankful for Triple S, because it not only allows them to grow OSFSP roots, they can also eat the leaves, which are the only green vegetable they can grow,” Cherinet said. Margaret McEwan, a social scientist with CIP who works on seed systems, said that Triple S can play a key role in helping to establish the crop in new areas. She explained that a small sand basin, box or pit can that holds 40-50 small-to-medium-sized roots will produce sufficient vine cuttings to plant about 0.36 hectares, which can produce enough OFSP roots to meet the vitamin A requirements of a family. McEwan noted that because Triple S allows farmers to plant earlier than they otherwise would, and produce more OFSP, it can extend the period during which they have fresh roots to eat, increasing their vitamin-A intake. She noted that it is also a climate-smart technology. “As rainfall patterns become more unpredictable, farmers need to take advantage of whatever rain there is as quickly as possible,” she said. Germame Garuma, Deputy Head of the Bureau of Agriculture and Natural Resource Management in Ethiopia’s Southern Nations, Nationalities and Peoples’ Region, mentioned during a workshop in Kenya that Triple S is already helping Ethiopian farmers deal with the effects of climate change. McEwan explained that CIP tested Triple S in nine sub-Saharan Africa (SSA) countries before it began working with partners to promote it to rural families on a larger scale, with support from the UK Department for International Development (DFID) and the Sweetpotato Action for Security and Health in Africa (SASHA) initiative, among other funders. 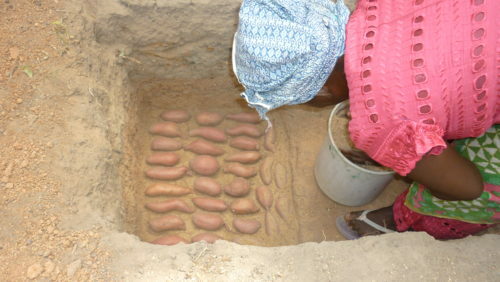 She added that in Malawi, CIP project manager Erna Abidin found that families were eating the roots they stored in sand before the planting season arrived, so she began promoting sand storage specifically to preserve OFSP roots for consumption, which can complement storage for planting material if farmers store enough roots. Abidin subsequently promoted and evaluated both practices in Ghana and Burkina Faso. With support from the CGIAR Research Program on Roots, Tubers and Bananas (RTB) Scaling Fund, McEwan, Cherinet and other colleagues are working to take Triple S to scale, with an aim of reaching 45,000 farmers in Ethiopia and Ghana between 2018 and 2019. According to McEwan, that initiative combines training of trainers, video-based extension, media campaigns and other efforts to get farmers to adopt sand storage, best agricultural practices, careful selection of roots for vine production and other measures that will help them produce and consume more OFSP – a package she calls Triple S Plus. Videos on Triple S are available here. McEwan said that the initiative is designed to reach as many women as it does men, since women and children have the greatest need for the vitamin A that OFSP provides, yet women are all too often underrepresented in such interventions. She explained that while the scaling initiative is expected to improve the vitamin-A consumption and incomes of thousands of families, its main goal is to test and improve adaptive strategies for scaling Triple S Plus. She added that the Sweetpotato for Profit and Health Initiative (SPHI), through which CIP works with an array of partners in 17 SSA countries, could serve as a platform for scaling Triple S Plus across the region in the future. “We are hoping to trigger farmer-to-famer dissemination through experience and testimony, but what is the critical mass for achieving this and ensuring a technically effective implementation of the technology? That’s what we want to test,” she said.